Workforce issues, education and growing the business skills of entrepreneurs present and future will be center stage at the 2015 Aroostook Day at the Legislature Wednesday, Feb. 11. LEADers Encouraging Aroostook Development (LEAD), a key partner in the Aroostook Partnership for Progress (APP), organizes the event. "We sponsor Aroostook Day as an opportunity for members of the private, public and nonprofit sectors in Aroostook County to interact directly with our elected state representatives on issues of importance to The County," said Jim Davis, LEAD president. The event, held at the Senator Inn in Augusta, begins at 5:30 p.m. with a social hour, then dinner, followed by formal presentations. Ryan Pelletier, Executive Director of LEAD and Director of Economic and Workforce Development at Northern Maine Development Commission, and Scott Voisine, Dean of Community Education at the University of Maine at Fort Kent, are the speakers for the evening. 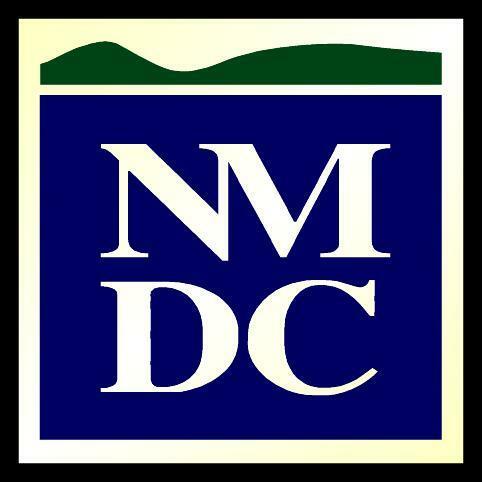 "This is a chance to inform not only our delegation, but other committee members as well about our economic development opportunities and challenges," said Pelletier. Voisine will focus on UMFK's Rural U Program, a fast-growing early college and dual enrollment program that serves students in 57 high schools throughout the state. He will also briefly touch on the new Aroostook Business Initiative, which brings the four higher education institutions in Aroostook County together along with other partners to increase interest in business learning opportunities for learners from middle school to adulthood. "We live in a state with dwindling resources for education, yet we are continually being held to a higher standard of accountability in education," said Voisine. "In order for this state to be able to continue to achieve a high level of educational quality and a broad breath of curricular choices to students at all levels then we need to realize a seamless, collaborative system of education in Maine from pre-K to 16 and beyond to adulthood. My message will be that initiatives such as Rural U and the Aroostook Business Initiative are important in this effort and are examples of what can happen when educational institutions and community partners can achieve when they come together for the betterment of the community." "Once the meeting is over, legislators are usually asked to give a brief update to the attendees of what is happening with them and issues that are coming up," Pelletier said. "The next day we try to hold a meeting with officials on a subject that LEAD has an interest, in the past it has been transportation related, but this year it will focus on growing the forest economy." Pelletier said invitees include LEAD and APP members, NMDC Executive Board, Aroostook-Washington Workforce Investment Board, Aroostook and Washington County legislators and legislative leadership. "Advocacy is part of the fundamental reason for our [LEAD] reasoning for being," said Davis. "This event is our way of being able to meet with our elected representatives and inform them very directly as to what our issues, concerns and our ideas are. We do not expect them in Augusta to necessarily be the solution. We like to bring ideas to them as well." Anyone who would like more information or to attend Aroostook Day at the Legislature is urged to contact Judy Dinsmore at NMDC by email at jdinsmore@nmdc.org or by phone at (207) 498-8736. 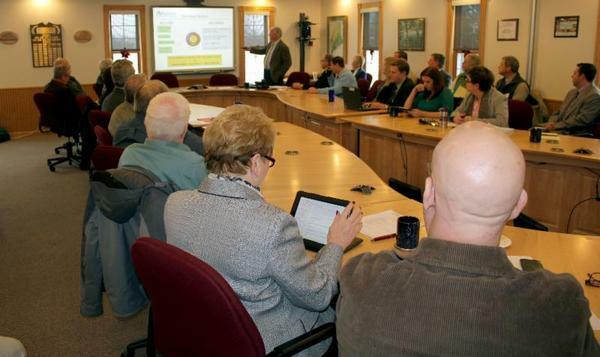 APP recently briefed a group of Aroostook County legislators about economic development in the region. From left are Rep. Danny Martin, Sen. Mike Willette and Rep. John Martin. CARIBOU - The First Regular Session of the 127th Maine Legislature convened Dec. 3, but the real work does not get underway until Senators and Representatives return to Augusta in January. 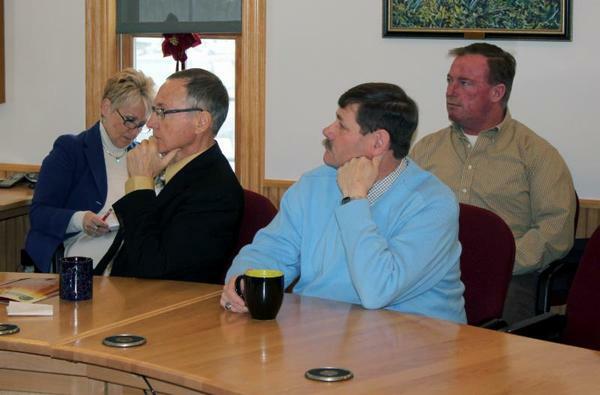 To help better prepare Aroostook County legislators, Aroostook Partnership for Progress (APP) hosted an information session Tuesday, Dec. 9, for area lawmakers. APP President Bob Dorsey said the meeting focused on three primary issues. The potential for rail car manufacturing at the Loring Commerce Centre, mining at Bald Mountain and the need for the expansion of broadband services in rural Aroostook County. Carl Flora, President of the Loring Development Authority, Anthony Hourihan of J.D. Irving and Don Flewelling of Pioneer Wireless presented on the three topics respectively. Flora said the possible Norinco rail car manufacturing facility and the projected 280 jobs is just the start. "Increased rail traffic will open the door to other possibilities," he said. Hourihan told the group that even though mining regulation changes may have stalled in the last legislature, the issue will be readdressed and hopefully a compromise can be found. 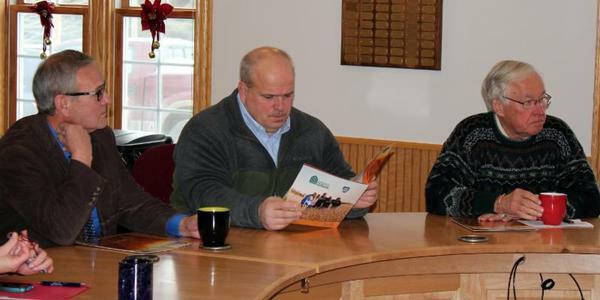 Sen. Peter Edgecomb (left) and Rep. Robert Saucier listen as APP President Bob Dorsey discusses economic development activity in Aroostook County. Flewelling addressed the need for robust Internet connectivity in Aroostook. He said there are many underserved areas and some federal and state dollars have helped grow broadband, but more needs to be done. "These issues comprise two of the biggest opportunities for economic growth in Aroostook and perhaps the greatest challenge, outside of younger workforce retention, in the County," stated Dorsey. "We have been advocating for a balanced approach to mining since 2012 and the growing need for modern rail cars has presented a tremendous opportunity for Loring." APP currently sees a potential for more than 1,000 emerging jobs if these and other forestry/manufacturing jobs occur due to anticipated demand rising for Aroostook forest products which could result in a greater than $100 million increase in Maine gross domestic product. According to Dorsey, "It is important our legislators understand Aroostook's major opportunities and challenges prior to them considering the bills they will review in Augusta and to be aware of the impact bills may have on either supporting or hurting these issues." Legislators in attendance were Representatives John Martin, Danny Martin, Robert Saucier and Senators Mike Willette and Peter Edgecomb. APP and LEAD members gather for a meeting with local legislators.